If you’re in the mood for a sugared piece of romance candy then this little novella is the right choice. It focuses on Lexie and Blake, two people who are at a crossroads in their lives where they finally face the fact that they are lonely. So alone that not having someone to love and trust is wearing on them but neither know where to turn. Enter the Mating Call Agency and its were-owl proprietor. For some reason, people believe Eve can work magic and they go to her when they want someone they care for, or love, to be happy by falling in love. Unbeknownst to either Blake or Lexie, they’ve both got someone who cares enough to go the extra mile to give their relationship a chance. The first step is to get them to meet. The rest is pure happy fun. The plot of Blake and Lexie falling in love is diluted a bit with a concurrent side trip about Eve and her past love. From what I gather, Ms. Red’s intent is to finally give Eve her own HEA eventually. She’s done so much for everyone else in town, she’s sure to be due and I am totally behind that concept. I just felt the level of that foreshadowing was a bit heavy handed and it was a disservice to both Blake and Lexie. Perhaps if the book was longer it would have balanced better with the plot. As it was, I kind of felt shortchanged because I really liked the adorable, quick and quirky courtship that the two protagonists engaged in. I loved how they laughed and held nothing back. 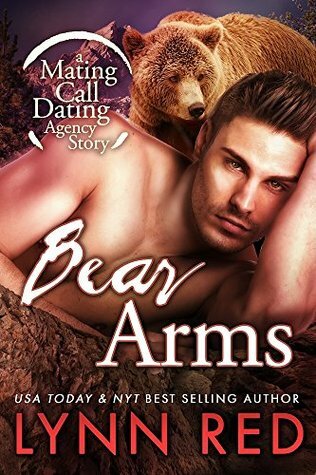 That being said, Bear Arms is a fast read and it’s enjoyable. A reader will find many scenes that will make them smile or smirk. The description of their drowning in the depths of each other’s eyes was quite romantic and the book is filled with delightful sugary sweetness with a bit of tart and sassy thrown in. This is a cute story and I was definitely entertained.